Yep, still pregnant. Emma will be an April baby! But I’m actually ok with that for the most part. Part of me hopes that Emma waits another 10 days or so, so that I can enjoy not working for a few days before having to take care of a newborn. If she doesn’t get that memo, oh well. But it’d just be nice to laze around for a few days instead of going straight from working full-time to baby care. Really, the main reason why I’d rather not be pregnant at this point is to sleep better at night and we all know that there won’t be much sleeping happening anyway once Emma comes, so I’d settle for just a few days of rest. I am glad that I’ve been working up until this point, but I’m definitely ready to be done. This is my last week! I had my 39 week appointment this afternoon and the doctor said that I’ve made progress since last week. Emma is lower down in my pelvis, and I’m dilated 1 cm, 50% effaced. And we’re both still healthy, so that’s good. No talk of induction as of now (but there probably will be at my appointment in a week, if I make it until then). I’m really hoping to avoid being induced, because I think that will really lower my odds of being able to go without an epidural. But in the end, the most important thing is that Emma is healthy. On Saturday, Travis and I helped out at our friend’s race, which was rescheduled from the previous weekend due to the snowstorm. 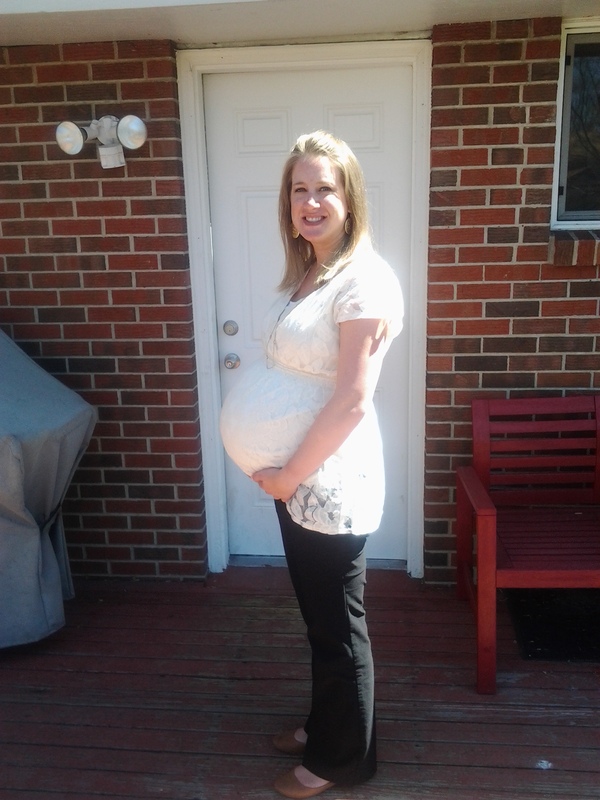 It wasn’t that bad being at the race 39 weeks pregnant but afterward, my hips were killing me. I guess that means I overdid it. Luckily, they loosened back up yesterday after moving around a bit and taking a walk. For Easter yesterday, Travis and I went to church but then we spent the rest of the day as a normal Sunday, since all of our friends were all doing family stuff and we don’t have any family nearby. We didn’t even have a special meal or anything. I was exhausted from Saturday anyway so I took a nap and then tided up the house, did laundry and cleaned. I probably would’ve done none of that except the nap part, but I don’t want to be caught with a dirty house if Emma decides to show up this week. Kind of a weird/sad Easter but it is what it is. Emotions: My due date being 6 days away feels very surreal. And I feel tired. What I Miss: Wardrobe with more variety, sleeping through the night without getting up to pee or having crazy dreams – last night, I dreamed that Emma turned out to be a boy and I had only brought a pink outfit to the hospital so that’s what we had to dress him in. Looking forward to: Only 4 days of work left after today! ← Getting back into running…soon. I hear ya on the sleep! It’s not fair to not be able to get a good night’s sleep, then when the baby is born to get even less sleep. The single digits until due sate is so surreal! We will be holding our little ones in no time (even though it feels like forever). April sounds like a lovely time to be born. 🙂 Lookin’ good girl!! Yay for April babies! I’m hoping you get a few days off before Emma arrives – that sounds nice. I’m trying to work up until my guy decides to come, but the closer I get, the more doubtful I feel about my energy level being about to keep up with the demands of FT work. Time will tell! Can’t wait to hear when you have the baby!! You look beautiful, Kathy! I look forward to seeing photos of sweet Emma when she’s born! Mark and I have been thinking about you guys! You look awesome! Can’t wait to see pictures of Emma soon. Praying for a safe and easy delivery for you!